For illumination, status indication, and display, the tungsten-filament incandescent lamp has been the fundamental light source since 1911 when the first practical method for fabricating tungsten wire was developed. Incandescent tungsten radiates extremely well in the visible spectrum; it has the highest melting point of all metals and the lowest evaporation rate at elevated temperatures. The tungsten-filament lamp is inexpensive, long-lasting, and versatile, and is available in a multitude of sizes, configurations, and ratings. Since incandescent tungsten radiates light extremely well in the visible spectrum, they are an effective light source for display illumination in edge-lit panels. The figures, scales, dials, and line displays are engraved on the surface of a translucent plate of any practical shape and size, which is backed by an opaque (usually black) panel or a printed circuit board. 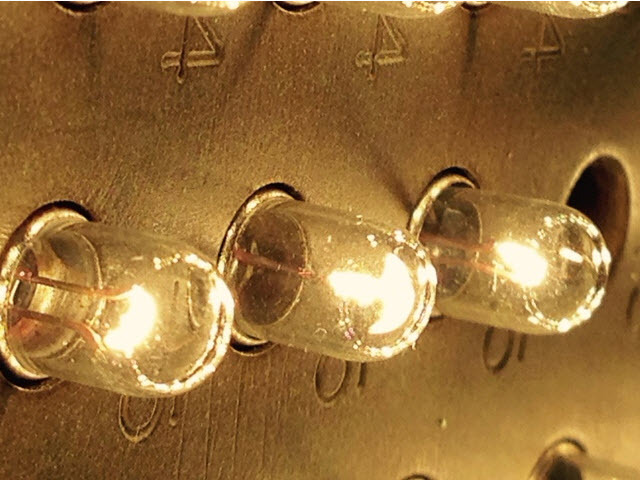 Subminiature incandescent lamps are either embedded at strategic intervals in the clear plate and connected by internal circuitry or mounted on the P.C. board so as to fit into cavities in the clear panel. Light from the lamps is internally reflected within this panel–since its angle of incidence is beyond the critical angle–and is unable to emerge except by scattering at the engraved markings. The assembly constitutes a form of light pipe that illuminates the markings yet allows most of the ambient light to pass through the display, thus providing excellent contrast capabilities. A highly effective source of edge-lighting are Lumitron T-3/4 MS90452 type lamps and Lumitron T-1 Short MS90451 type lamps. Night Vision Imaging System (NVIS) compatibility can be achieved by using Lumitron NVIS ring filters designed specifically for edge-lighted panels. Wedge lighting is commonly used in aircraft instrumentation; it allows the entire instrument face to be illuminated from the wedge and will light areas that otherwise may be completely inaccessible to light from other sources. Incandescent tungsten radiates light extremely well in the visible spectrum and is an extremely effective light source for wedge-lighted instrumentation. The effectiveness of this type of lighting method depends upon the light entering the thickest edge of the wedge and its internal reflection. Light is reflected back and forth between principal surfaces; at each reflection the angle of incidence becomes more acute until it approaches the critical angle at which point some of the light escapes from the wedge and continues to do so at each succeeding reflection. Light escaping from the back of the wedge is in effect harnessed to illuminate the face of the instrument. The location of the subminiature lamps is an important consideration, and strategic placement allows optimum light distribution and brightness. The addition of opaque white paint to the top of the edges of the wedge will increase brightness and also prevent light from escaping and flooding the instrument. Night Vision Imaging System (NVIS) compatibility can be achieved by using Lumitron NVIS ring filters designed specifically for wedge-lighted instrumentation. Back lighting consists of light emanating from behind a display and through translucent material. Subminiature lamps are located behind the display and may illuminate directly or they may be embedded in a light conducting transfuser block located directly behind the display that is designed to uniformly distribute light over its surface and thereby giving a uniformly bright transilluminated display.